Year after year, brick-and-mortar stores are confirming the importance of the relationship between a company and its customers, while rapidly evolving to the new multi-channel mode of business. 1/ The quality of customer reception and the efficacy of services provided. When the client visits an agency, he leaves with a positive image of the brand and his loyalty is strengthened. 2/ The reliability of sales people in processing transactions, a task that is complicated by ever-changing processes, offers and regulations. Advisors end up saving time, which they use to increase the number of contacts and sales. 3/ A more agile harnessing of new technologies, including data mining and CRM. By being more proactive, agencies manage to increase their sales. Increase customer satisfaction: the manager and her team improve customer reception, signage, and line management. Result: +15% to the “Customer Satisfaction” index, measured each week. Gain commercial time: the apparent complexity and rapid evolution of processes and products made it difficult for sales people to close deals. Quality management methods derived from the industrial world (red bins, dojos, auto-control, etc.) allows sales people to build ease and confidence with the processes. 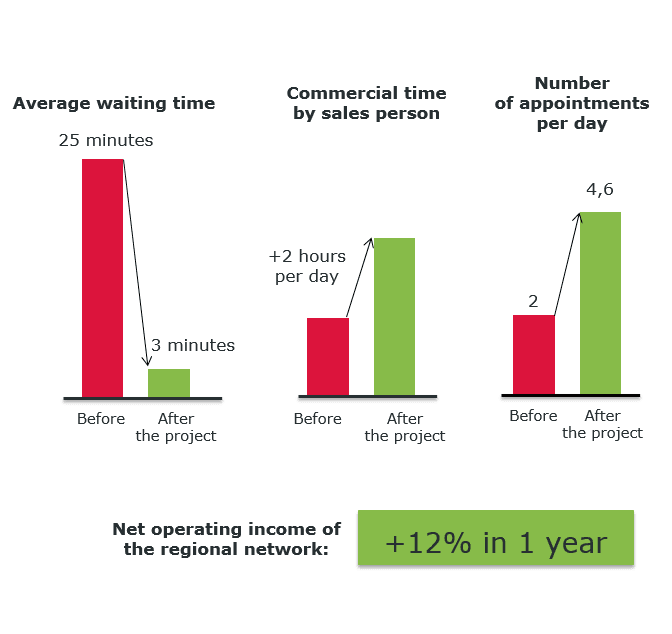 Result: Each sales person gains between one and two hours per day, which they dedicate to selling. Take each contact with customers and prospects as an opportunity to promote the company’s product line: people who visit agencies are more satisfied with the services they receive, and thus more receptive to new advice. Sales people can then develop their expertise in using CRM applications, obtain new appointments, and implement new solutions to fill up their agenda.